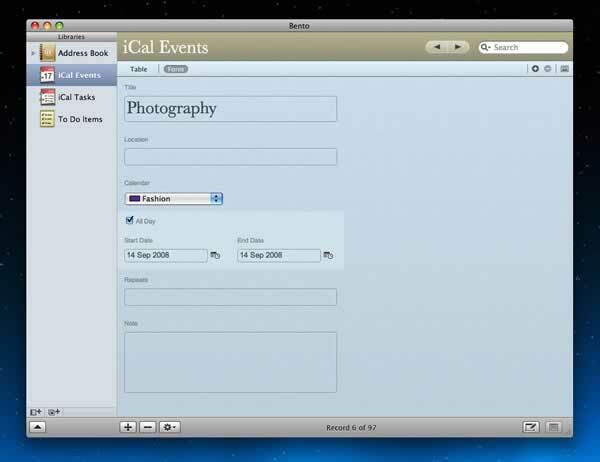 Whilst Microsoft dominates the database geekery scene in the world of Windows, Mac users can sit back and enjoy the delightful little app from FileMaker, called Bento. Now in its second iteration, Bento 2 offers one of the easiest and fastest ways to setting up your own databases. Bento 2 has fairly modest hardware requirements, however it’s only designed to run on Leopard, so as long as you meet that requirement then you’re likely to be running a system powerful enough for Bento. 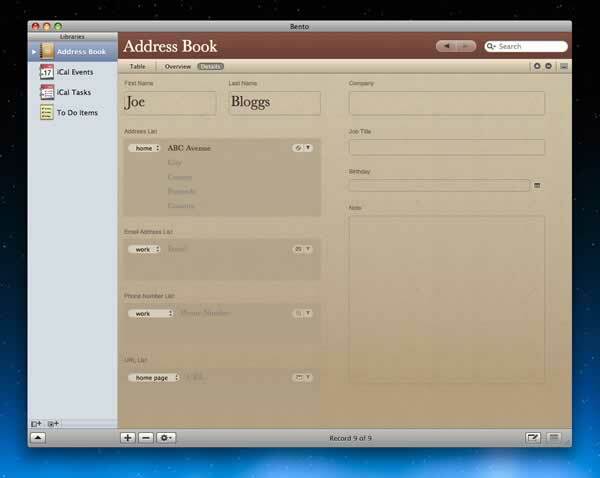 One of the best features that I found to be the most useful in Bento 2 is its tight integration with OS X and its native applications such as Address Book, iCal and Mail. There’s a level of transparency that is shared with these apps in Bento that allow you to make copies or tie the data in with your own database fieldsets. Create these from scratch or use one of the included templates that cater for a variety of needs. From inventory tracking to customer databases, Bento has it covered with its wide selection of templates. I wasn’t able to find a suitable template for tracking and scheduling all the stuff I have to keep a track of such as product collections, review publishing deadlines, etc so I decided to create my own from scratch. I was a bit reluctant to do this as I thought it would take more effort than it was worth to setup, but I was surprised by how easy it was to get a basic system up and running and then tweak it as required. For me, the killer feature had to be the ability to tie Mail messages to records in my database. I was able to tie all related messages to a specific record and use Quick Look to view the e-mail. It’s a great way to keep a track of correspondence in my scenario, but I can see this being an invaluable feature for a multitude of uses. You can also customise the database templates by using the custom controls panel. There’s 20 field types to choose from including the ability to create relationships between various libraries such as your address book or linking Mail to your database. A simple search query box is built in, so you can make user-friendly searches for records within your database system without needing to create custom queries. If you want to narrow your searches down to a certain set of criteria, Bento has a more advanced search tool for doing Spotlight-esque searches such as refining the results with date criteria. You can then save these searches as ‘collections’ which let you refer back to them. These collections automatically update when new records are added to your database that match your original search criteria. One of the collections I setup was to view all courier collections for review items that are taking place within the next two days. Whilst this isn’t anything more than what any other database can do, it’s Bento’s elegance in the way it’s able to perform powerful queries like this with just a few mouse clicks that makes it unique. The final word has to be that Bento 2 is an excellent application for creating and managing basic database systems for home or small businesses. Perhaps you’re a freelance designer, I can see how some of the pre-built templates will allow a web designer to keep a track of time for invoicing and record-keeping purposes. Bento is designed to be used in a logical fashion that doesn’t require any database expertise. Whilst that is Bento’s greatest strength, it’s also what limits its capabilities as the useage scenarios are limited to whats available within the templates. 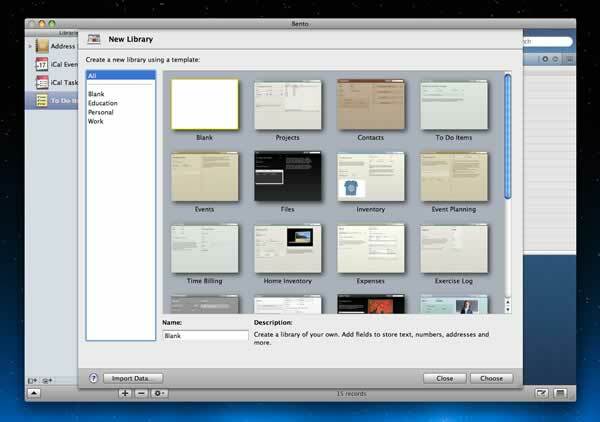 As far as databases go for OS X, you can’t go far off the mark with Bento 2, so long as you have a realistic expectation of what it’s capable of.